In a suburb on Boston’s North Shore, a catatonic little girl is found behind a dumpster. She is a mystery. As Social Worker Debbie Gillan pieces together the puzzle of the child's identity, she discovers the child had disappeared two years earlier along with a twin sister. 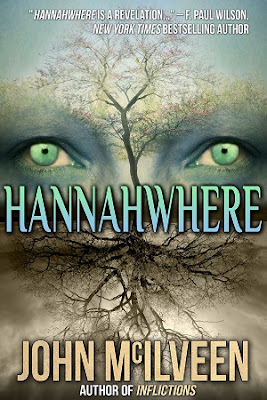 She also discovers HANNAHWHERE, an alternate world that is both a haven and a prison.... Life altering trauma becomes the key to unraveling the truth about the children, about Hannahwhere...and about Debbie herself. Truths that could either save them or destroy them all. John McIlveen did a super job of childhood trauma and what child will do to escape real life horror like abuse. When social worker Debbie Gillan meets the young girl, Hannah (found by a sanitation worker behind a dumpster, she feels herself losing her heart to the beautiful, white/blond-haired, blue-eyed child. From Hannah, she learns about Hannahwhere and Hannah’s twin sister, Anna, stuck in Annaplace (same spot as Hannahwhere). Hannahwhere is a place not unlike Oz, Fairyland, and other places of fantastical dreams and hopes. Where one can feel safe. Anna feels increasingly cold to the touch to Debbie and she begins to suspect why Anna cannot escape this place. For no longer a haven, this world has become a prison for Anna. But before Debbie can help Anna and even Hannah, she must confront her own childhood demons she has tucked down inside her and forgotten. 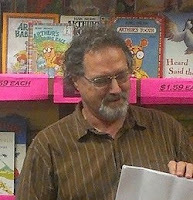 John McIlveen never shies away from the brutal horror, balancing it with the beautiful fantastical, and letting the characters lead with their hearts as well as their fears and develop into full human beings capable of a realistic emotions and relationships. He balanced pain, desperation, hope, and consequences, delivering an auspicious debut as a novelist. Hannahwhere will drag you into a world of heart and soul, and yet, as a dark fantasy novel, the horror is there. The book pulls punches like a primed fighter, meshing fantasy well with the reality. Be prepare to fall in love with Hannah and wonder why we all don’t have a place like Hannahwhere to escape our troubles. I give Hannahwhere 5 sheep. John M. McIlveen is the author of the paranormal suspense novel, HANNAHWHERE, and two story collections, INFLICTIONS and JERKS AND OTHER TALES FROM A PERFECT MAN (which is also compiled in the collection INFLICTIONS). He is the father of five daughters, works at MIT's Lincoln Laboratory and lives in Haverhill, MA with his partner, Roberta Colasanti. John has an affinity for black licorice, whoopie pies, and good tequila. He is currently working on his next novel GONE NORTH. Wow. This is definitely a book for me and your review convinced me to go learn more! Perfect for October reading.